I would like to congratulate LP endorsers Pablo "Chino" Nunez and George Delgado. Chino and George perform on the Spanish Harlem Orchestra's Grammy Award-Winning recording "Across 110th Street". The album won "Best Salsa/Merengue Album". 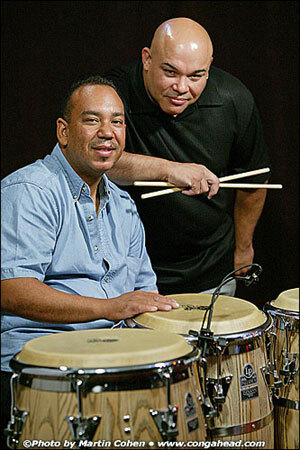 Chino Nunez and George Delgado will be part of an upcoming LP instructional video, "The Rhythmic Instruction of a Salsa Tune, Vol. 2: The Interaction of Players". This is a follow up to Chino's first video The Rhythmic Construction of a Salsa Tune, Volume 1. This second installment is currently scheduled to be released in late summer 2005. In addition, LP endorser Justo Almario performed on "Ahora Si! ", Israel "Cachao" Lopez's Grammy Award-Winning recording. The recording won "Best Traditional Tropical Latin Album". Congratulations and best wishes to these fine musicians! 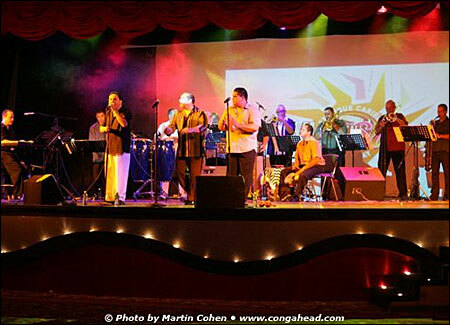 To see PHOTOS from Ruben Blades / Spanish Harlem Orchestra At El Flamingo, CLICK HERE. To see PHOTOS from Justo Almario Recording during LP's visit to LA, CLICK HERE. To see the VIDEO from LP's visit to LA, CLICK HERE. Spanish Harlem Orchestra performing in St. Maarten. Justo Almario Recording during LP's visit to LA in late 2004.